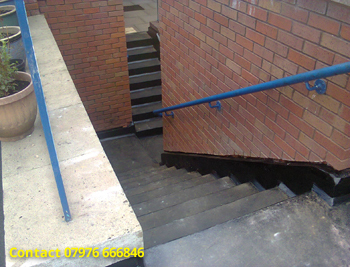 Shows concrete steps leading to both balconies, treads and risers in mastic asphalt on high bond primer to concrete base, with mastic asphalt upstands to brickwork tucked into chase. Shows resulting drainage, where steps and balconies previously held water. 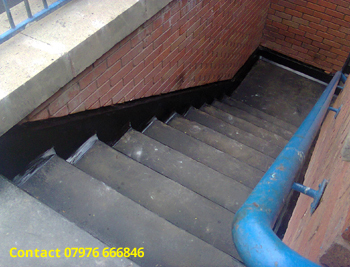 Mastic asphalt laid to falls allows the water to disperse to tarmac footpath and outlets to drain. 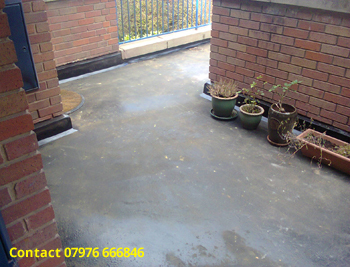 Balcony areas laid to falls in mastic asphalt also serving as a flat roof above storage areas. Where point loading, table and chairs are used it is recommended to tile or lay slabs to the areas required, paving grade asphalt is suitable for foot traffic. 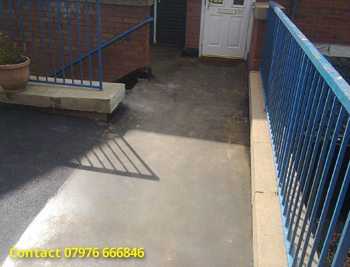 Shows mastic asphalt joined to tarmac footpath area. Shows steps in uniform to illustrate safety aspects, further non slip coatings and paint can be applied to the mastic asphalt if necessary. 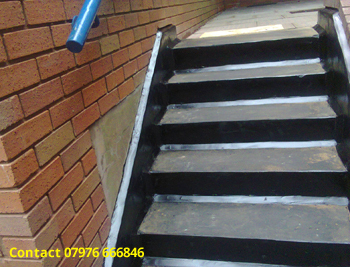 The benefits of mastic asphalt to steps are. 1) The treads can be re-set in most cases making step height safer. 2) Water can be dispersed, less chance of ice forming in winter months. 3) The angle fillets in the asphalt make the steps easier to clean with the asphalt surface eliminating dust from concrete. 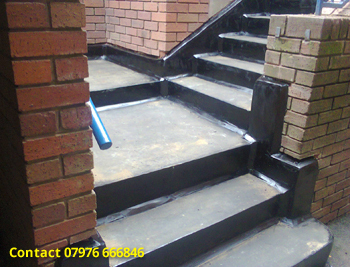 4) The asphalt to steps and balconies is also a flat roof detail which protects any areas underneath from water ingress.